We offer our clients a wide spectrum of packaging material that is fabricated using superior quality raw material such as special food grade LDPE material for packaging food items and shampoo grade LDPE rolls for FMCG products. Available in a variety of sizes, shapes and colors, these packaging material are highly durable and safe to use and can also be offered in customized specifications as per client requirement. Our gamut encompasses Food Packaging Material, FMCG Packaging, Agricultural Packaging, Pharmaceutical Packaging Material, Pouches & Rolls and Type of Pouches & Rolls. The assortment of Food Packaging Material includes Biscuits Packaging, Tea / Coffee Packaging, ORS Packaging, Flour Packaging, Grocery Packaging, Frozen Food Packaging / Sea Food Packaging, Ketchup Packaging and Snack Food Packaging. We provide a range of FMCG Packaging consisting of Shampoo Packaging, Detergent Packaging and Undergarment Packaging. The gamut of Agricultural Packaging offered by us comprises Seeds Packaging and Pesticides Packaging Pouch. Our assortment of Pouches & Rolls includes Rotogravure Printed Pouches & Rolls, Laminated Layer Pouches & Rolls, BOPP Re-Sealable & Reusable Pouches, Stand-Up Pouches and Metallized & Aluminum Foil Rolls & Pouches. The range of the Type of Pouches & Rolls encompasses Slider Pouches, Spout Pouch, Zip Lock Pouches, Square Button Pouches, Jumbo Bags and Laminated HDPE Bags. 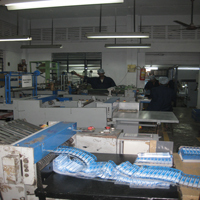 Apart from the above mentioned showcase, we also provide PVC Thermoforming & Vacuum Forming (Trays & Blisters) packaging material to our clients.